Two men have been charged in connection with the armed robbery and shooting of a transgender woman in the early hours of Friday. Authorities said Charles Marion Brown, 21, and Jujuan Alexon Williams, 19, jumped out of a car, brandished weapons, and told the 36 year-old victim to drop everything and run. 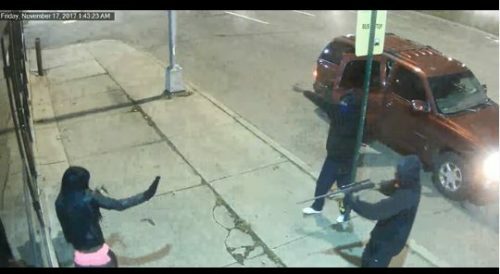 She did just that, dropping her purse and moving down the sidewalk, when Brown is said to have fired a semi-automatically rifle at her, firing five shots and striking her three times and critically wounding her. Police chased the pair, and arrested Williams when the vehicle struck a concrete barrier. Brown escaped on foot but was arrested the next day. “On the eve of the national Transgender Day of Remembrance, this case illustrates the horrific acts of violence to which transgender persons are subject,” said Fair Michigan President Dana Nessel, in a joint statement with the prosecutor’s office. Fair Michigan works with the Prosecutor’s Office and law enforcement to investigate crimes against LGBTQ people. Charges against Brown include assault with intent to commit murder, armed robbery, use of a firearm in connection with a felony, and felon in possession of a firearm and being a habitual offender. Williams is charged with armed robbery resulting in serious injury, armed robbery, use of a firearm in connection with a felony, felon in possession of a firearm, and being a habitual offender.